Fourteen DNCBers braved the overcast and occasionally rainy Monday morning on a “local” outing to the Tsawwassen Ferry Jetty then around the Bay to the Container Port. Winter migrants are certainly arriving in full force as we saw thousands of birds including the Snow Bunting. Check out photos on the DNCB Picasa link. First stop after leaving Petra’s shortly after 7:30 a.m. was the dirt road to the boat ramp on the south (or east) side of the jetty behind the Tsa Tsu Shores condo. Five vehicles; not too bad for car-pooling the 14 who were: Roger, Mike, Glen, Marion & Marti, Kirsten, Ken & Anne Avery, Terry, Donna, Sheila, Kay, Scope-bearer Moira and me. The tide was high and receding so we had good looks at diving waterfowl close to shore, including Surf Scoters, Common Goldeneye (no Barrow’s as we had last Monday at Stanley Park), Bufflehead, Common Loons and Horned Grebes. We wandered along the shore toward the port and finally aroused our destination bird, a Snow Bunting. Everyone eventually got super looks at this bird as it fed on the bush seeds along the shore. Six Buntings have been seen at the jetty, but we only saw the one on Monday, and we were blanked on Horned Larks. We crossed the highway to the north side where Double-crested Cormorants were “drying” on the rocks. One Brant Goose was standing alone between the Cormorants and Mew Gulls. and some Scaup and a neat Song Sparrow flitting in the rocks. Several flocks/swarms of Shorebirds flew over the water, mostly Dunlin. We saw Bald Eagles flying overhead, but no Falcons arousing these shorebirds. A few Great Blue Herons still hanging around the condo near their Heronry. Ken’s camera died so Roger took the obligatory Group Photo with Tsa Tsu Shores behind us. Next stop (after a gas station “ladies” stop) was the Kingfisher Bridge on the TFN land. As usual, no Kingfisher, but a couple of Northern Flickers and a flock of Golden-crowned Sparrows caught our interest. We continued through the Ladner fields, stopping for a perched Red-tailed Hawk that was almost a Rough-legged. 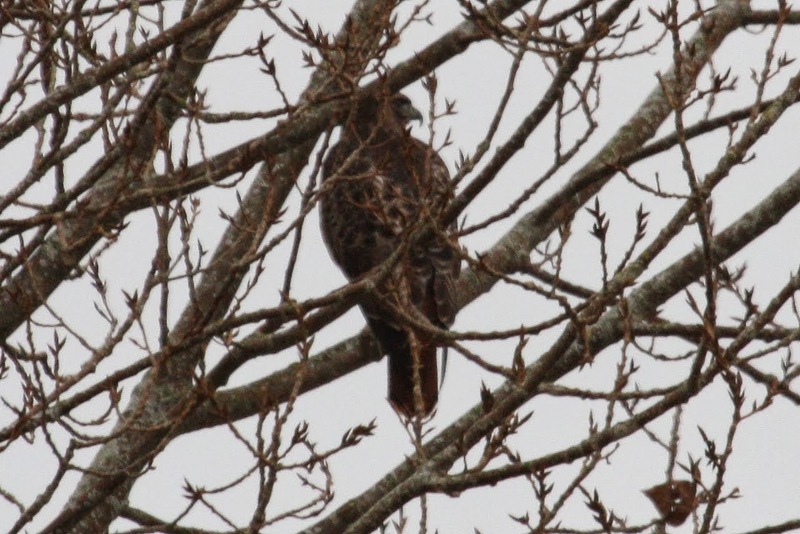 We think we did see a Rough-legged Hawk fly away from us, but not definitely sure. Our convoy then parked (legally) under the highway bridge leading to the Container/Coal Ports. We decided to check out the path on the south/east side of the Deltaport Road. More Golden-crowned Sparrows along the path, and literally thousands of birds in this Bay. I had not been on this section of the trail and it was an impressive sight. Being around 11:00 a.m. the tide had receded (high tide was 7:00 a.m.) so the birds were a bit far from shore. There were huge numbers of Green-winged Teal, Northern Pintail, American Wigeon and Mallards feeding in the mud, and Brant Geese and “divers” further out. Also tonnes of Shorebirds, but we recognized only Dunlin and Black-bellied Plovers. Our Smoko back at the vehicles was very brief as we munched on Kay’s Blueberry cookies, the only treats provided this morning. Hope PB Lorna returns soon. Then we crossed the railway tracks, under the direction of a CN Flagman, to the trail toward Brunswick Point. Lots of the same waterfowl in this Bay (Roberts Bank) too but a bit too far out. A Northern Harrier was perched on a mound in a field near to where two Trumpeter Swans were feeding. It was approaching Noon so we decided to call it a day. My vehicle drove to the Container Port to “turn around”. At the Port parking lot, following friendly interrogation by Security, we saw a “dead” Harbour Seal beneath us which opened its eyes and smiled at us. In this quiet bay were close-up looks at Horned Grebes, Red-breasted Mergansers and Pelagic Cormorants. No action at all on the Osprey tower of several years ago. We returned to Petra’s around 12:30 p.m. very satisfied with another enjoyable outing, and I didn’t crap on anyone (how boring). Next Monday, November 25 our outing will be “local” again. Leave Petra’s around 7:30 a.m. and go directly to Serpentine Fen Park in Surrey. We should be at the Serpentine parking lot (by the barn, see GOOGLE map) around 8:15 a.m. We may go to Mud Bay Park after Serpentine if there is time. This entry was posted in *DNCB, Bald Eagle, Black Oystercatcher, DeltaPort Causeway, Harbour Seal, Northern Harrier, Red-tailed Hawk, Rough-legged Hawk, Snow Bunting, Tsawwassen Ferry Port. Bookmark the permalink. I am looking for someone to take me to see the Snowy owls at Boundary Bay, can you help me. Thank you for your time.